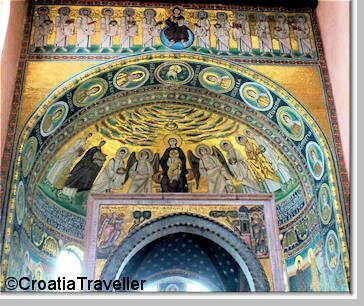 Outstanding examples of Byzantine art exist in Croatia, most famously in Porec's Euphrasian Basilica which dates from the 6th century. The first distinctively Croatian design feature emerged around 800AD and appears frequently on buildings until the 11th century. The interlaced ornamentation is called "pleter" and is still a popular design feature. 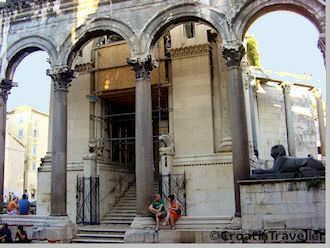 The Roman heritage in Croatia spans six centuries, beginning with 1st-century BC constructions in Istria and ending with 5th-century basilicas in Solin (Salona), near Split. Istria has excellent examples of buildings constructed during the classical, Augustan period when Hellenistic views of proportion and harmony permeated the architecture. The most outstanding example is the 1st-century Triumphal Arch of Sergius in Pula with its harmonious proportions, fine reliefs and Corinthian capitals. The Temple of Augustus also reflects the purity of classical style while the Pula amphitheatre shows the transition to more monumental architecture. Along the coast you'll also find streets laid out according to Hellenistic principles. In Pula and Trogir you'll see that the Romans retained the oval ground-plan and radial streets of older settlements but in Porec and Zadar the streets intersect at neat right angles in the typical Roman layout. As in any Roman city, the centre is cut into four parcels by two perpendicular streets, the Cardo and the Decumanus. In the ruins of Solin, the first stirrings of Christianity can be glimpsed. In the necropolises of Marusinac and Manastirine, monumental basilicas were raised in the 5th century around the graves of the 4th-century Christian martyrs Domnius and Anastasius . The aisled basilica of St Stasat Marusinac, with its open nave, is a rare example of a roofless basilica in which open-air funeral rites were performed. The unusual width of the nave recalls the Peristyle of Diocletian's Palace in Split, a World Heritage site and the largest Roman monument in Croatia. The most impressive Romanesque church in Croatia is the circular Church of St Donat in Zadar which dates from the 9th century. Later Byzantine culture grew in influence along the coast, leaving its mark in the small church on Lopud island. The earliest Gothic style appeared in Trogir on the renowned Cathedral of St Lovro, carved by Radovan around the same time as the carved wooden portal on Split's Cathedral of St Domnius. In Zagreb the Cathedral of the Assumption of the Blessed Virgin Mary displays early Gothic influences. Late Gothic style reached its highest expression in Croatia in the work of Juraj Dalmatinac whose finest work was Sibenik's Cathedral of St James, built entirely out of stone. 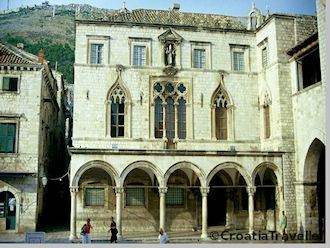 For Renaissance architecture in Croatia, Dubrovnik has no equal. Although much was destroyed in the 17th-century earthquake, the splendid Sponza Palace remains as an example of the style that once permeated the Adriatic city. Introduced by Jesuit monks in the 17th century, the baroque style is characteristic of northern Croatia, particularly in Varazdin which has a stunningly well-preserved baroque centre. Zagreb also has fine examples of the baroque style. The Church of St Catherine, the Church of St Xavier and the mansions containing the Croatian Historical Museum and the Croatian Museum of Naive Art reflect the flourishing baroque style of the 18th century.